We thought modern technology made us lazy, but it turns out we’ve been looking for ways to stop moving for almost a century. 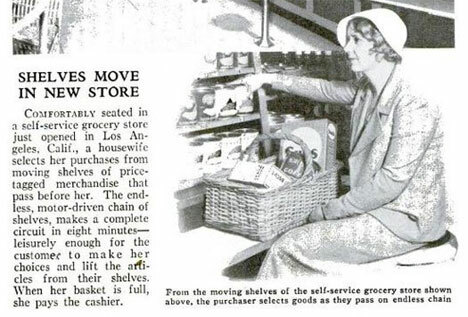 In the 1930s, automated grocery stores were all the rage with futurists and housewives alike. Rather than dealing with the tedious task of walking through the grocery store to choose items one-by-one, the automated grocery store would let shoppers just have a seat as conveyor belts drove the entire inventory past. The conveyor belt shelves made a complete circuit every eight minutes, giving shoppers plenty of time to select everything they need to feed a hungry family. Sitting at home ordering all manner of stuff online is pretty lazy, but it can be argued that sitting on a bar stool while the entire inventory of a grocery store marches past is even lazier. This store was built in Los Angeles in 1933, but luckily the idea didn’t stick around long enough to turn us all into fat, lazy future people – we had to wait another 60 years or so for the Internet to do that for us. See more in Retrofuturistic or under Vintage & Retro. March, 2011.